Aging is unavoidable. Aging beautifully, gracefully and healthily however, is an art. She obtained her MD degree with distinction in 1986 from Medical Academy (Wroclaw) in Poland. Straight after an internship she specialized in neurology, but in 1991 she emmigrated to South Africa where she started her new life and a new path in her medical career. In her first 9 years in South Africa she was working in a provincial hospital in Rustenburg, where she was exposed to a very broad spectrum of medical practice. This enabled her to develop an array of skills and deepened her knowledge of all the main disciplines in medicine, including internal medicine, surgery, pediatrics, anesthesia, psychiatry as well as obstetrics and gynecology. Following this period of professional enrichment, she opened her own private practice where she also offered limited alternative medicine including acupuncture. She always believed in a holistic approach in treatment of patients. In this time she also developed a passion for aesthetic and anti-aging medicine. She attended one of the first trainings in South Africa in performing Botox injections. 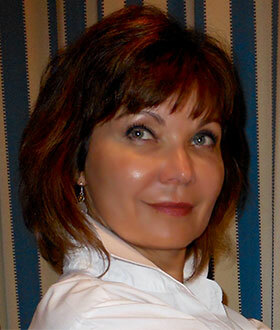 In 2000 she opened the Rustenburg Anti-Aging practice where for many years she treated patients with aesthetic problems using minimally invasive procedures. In 2001 she was also offered a job, which she accepted, as a generalist with Anglo Platinum. 8 years later, she took another challenge, together with her husband Noel, also a medical doctor. Having a wish to see more of the world, they accepted a position as ship's physicians on large ocean cruise liners, sailing and treating patients in many parts of the world.